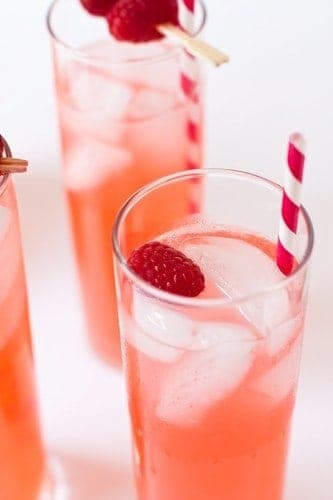 I don’t normally post beverages on MBA, but it is officially summer and my Raspberry Lemonade Recipe is the perfect way to beat the heat. This recipe came about last week when I had a container of raspberries starting to get a little on the mushy side. I also had a huge bag of lemons, so it seemed natural to combine them to create a sweet, tart, ice cold drink. The results were delish! I make fresh lemonade a lot during the summer months; it’s so easy and in my opinion tastes much better than the powdered variety. When I was a kid, there was a family owned lemonade stand that would make appearances at the local festivals. Their lemonade was amazing because it had that perfect balance of sweet and tart. I tried to replicate that balance in this recipe and hope you get that smooth sweet flavor with a little pucker. Having a get together at your house? You can most definitely throw in a little tequila or vodka to make one heck of a summery adult beverage. Have a plethora of strawberries or blueberries right now? Perfect, use the same method, just sub in different fruit for the raspberries. Is your mint plant growing like crazy? Infuse your simple syrup with some mint leaves (strain out when infused) and garnish your glasses with it as well. Gorgeous and tasty. 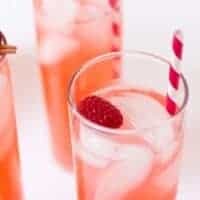 Once the simple syrup has cooled, combine the raspberry puree, simple syrup and lemon juice in a large pitcher.